Mitch McConnell obstructed not only Obama’s Supreme Court pick but his effort to alert voters about Russian election hacking—inextricably tying these issues together. 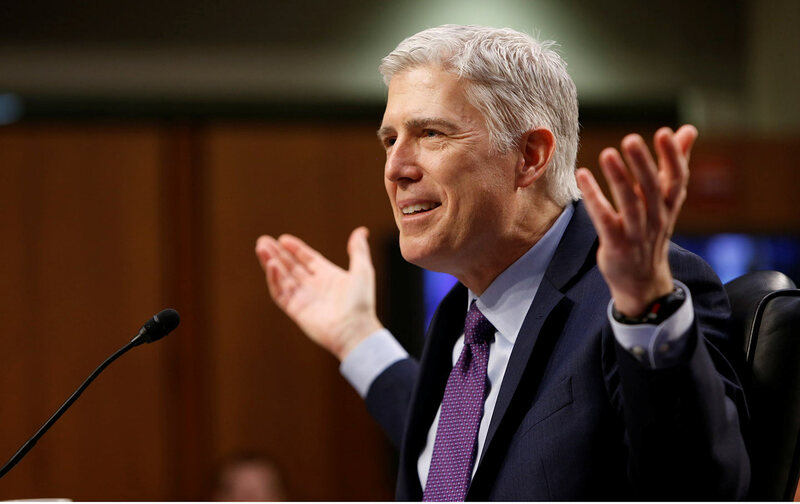 A growing number of Senate Democrats want to pause confirmation hearings for Donald Trump’s Supreme Court nominee Neil Gorsuch while the FBI probes alleged coordination between the Trump campaign and Russia to interfere with the 2016 election. Rather amazingly, that includes Senate minority leader Chuck Schumer, who began the Trump era promising to work with the new president. On trade, on infrastructure, on “draining the swamp,” Schumer saw openings for cooperation. “We’re going to challenge President Trump to work with us on those issues,” he told The New York Times in January. Indeed. And the man most responsible for blocking President Obama’s Supreme Court pick also prevented Obama from coordinating a bipartisan warning to the American people about Russian hacking. The Gorsuch confirmation and the Russian hacking issue are inextricably tied—because Senate majority leader Mitch McConnell personally tied them. Everyone remembers the night Supreme Court Justice Antonin Scalia suddenly died, at a luxury hunting resort in Texas, more than 11 months before the end of President Obama’s second term. One of the first voices we heard was McConnell’s. “This vacancy should not be filled until we have a new president,” he declared, shockingly. It was “at a time when other elected officials,” Politico reported, “from Sen. Bernie Sanders to future Senate Democratic Leader Charles Schumer, were releasing statements offering condolences to the justice’s family, which includes 26 grandchildren.” McConnell jumped out crudely and diabolically, restricting Obama to just three-quarters of his second term. But that wasn’t McConnell’s only dirty role in 2016 presidential politics. The Senate majority leader also blocked the Obama administration’s attempts to organize a bipartisan statement on US intelligence agencies’ evidence of Russian election hacking, which had begun to look like it was deliberately favoring Trump. According to The Washington Post, at least some Republicans were willing to consider Obama’s October request. But not McConnell. He promised “that he would consider any effort by the White House to challenge the Russians publicly an act of partisan politics.” Thus no such statement was made. The combination of McConnell’s blocking Garland, and his refusal to participate in warning about evidence that Russia was behind the hack of Democratic campaign e-mails, shows that he was on high alert throughout 2016 to fulfill his ultimate goal: defeating Hillary Clinton and snatching back the empty SCOTUS seat from Democrats. I think Democrats should be just as determined to block Gorsuch now—especially since Trump is now under “a big gray cloud,” in the words of House Intelligence Committee chair Devin Nunes. I share here my standard disclaimer on Russian hacking allegations: We have only the word of 17 intelligence agencies (which is, to be honest, a rare level of agreement) and we cannot rely on those agencies to be the last word on a topic this incendiary. A bipartisan independent investigation is essential—yet McConnell has blocked that, too. More troubling news about Trump campaign officials’ ties to Vladimir Putin and his allies emerges every day. On Wednesday the Associated Press revealed that former campaign chair Paul Manafort was paid by a Russian aluminum magnate to influence US politics on behalf of Putin and his Ukrainian allies. “Manafort proposed in a confidential strategy plan as early as June 2005 that he would influence politics, business dealings and news coverage inside the United States, Europe and the former Soviet republics to benefit the Putin government, even as U.S.-Russia relations under Republican President George W. Bush grew worse,” the AP reported. As even Republicans begin to acknowledge the cloud over the Trump administration, congressional Democrats should argue that a compromised president should not be able to appoint a Supreme Court justice who might sit on that bench for 40 years. Especially since McConnell blocked the moderate Merrick Garland, age 64 to Gorsuch’s 49, who was chosen by Obama specifically to win GOP support. It didn’t work. Republicans argued last year that “eight is enough” on the Supreme Court (some even threatened to keep Clinton from making a pick for the coming four years). Democrats should officially agree, for now.